What Is Class D Airspace? Class D airspace is the space that surrounds airports that have an operating air traffic control tower, but don't have radar services (or at least the airport is not required to have radar). The airspace surrounding a Class D airport is only classified as a Class D airport when the air traffic control tower is in operation. When an airport's traffic control tower is not in operation, the airport reverts from a Class D airport to a Class E airport or a combination of a Class E and Class G airport. 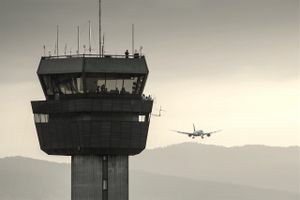 The control tower at a Class D airport provides traffic separation for Visual Flight Rules (VFR) and Instrument Flight Rules (IFR) traffic and can provide VFR traffic advisories, workload permitting. The following factors need to be considered when defining Class D airspace. Dimensions: Class D airports can be tailored to fit instrument approach procedures that are available at the airport, which means that one Class D airport might look slightly different from another. Literally, the dimensions depend upon instrument approach procedures into a particular airport. It's worth noting that there are extensions for arrivals and departures factored into the airspace dimensions. Normally, the airspace surrounding a Class D airport extends from the surface up to a designated MSL altitude, usually about 2,500 feet Above Ground Level (AGL). Entry Requirements: To enter Class D airspace, a pilot must contact the control tower and establish two-way radio communication prior to entering the airspace. During the call, you must provide Air Traffic Control (ATC) with your position, altitude, current transponder code, and your destination/intentions. You'll know you've established two-way communication when you get a call-back that includes your callsign (tail number). If you do not hear your number you can not enter the airspace. If the controller is busy, they can ask you to stay out of Class D airspace until they are ready. Speed Restrictions: In any airspace, aircraft can't exceed 250 knots when below 10,000 feet Mean Sea Level (MSL). However, when you're within 4 Nautical Miles (NM) of the primary Class D airport and at or below 2,500 feet AGL, you can't exceed 200 knots. Weather Minimums: Class D minimum weather requirements exist so that you can see and avoid other aircraft. Because not all Class D control towers have radar scopes, ATC wants you to stay far enough away from the clouds so that you can see and avoid other airplanes, especially jets flying fast approaches. An easy way to remember VFR weather minimums for Class D airspace is the phrase "3 Cessna 152s." Each number in the phrase strands for a distance (i.e., 3 stands for 3 statical miles; 1 stands for 1,000 feet above the clouds; 5 stands for 500 feet below the clouds, and 2 stands for 2,000 feet away from horizontal clouds). VFR Visibility and Cloud Clearance Requirements: Pilots flying into Class D airspace must maintain at least three statute miles visibility. In addition, pilots must remain at least 500 feet below clouds, 1,000 feet above clouds, and stay 2,000 feet away from horizontal clouds while in Class D airspace. Chart Depiction: Class D airspace is depicted as a dashed blue line on a VFR sectional chart. You may notice that the airspace extends into the arrival and departure paths for IFR traffic. There are other classifications of controlled airspace (and their defined dimensions) within which ATC service is provided. The other classifications include Class A, B, C, E, and G.
Class A Airspace: Class A airspace is generally airspace from the surface to 18,000 feet MSL up to and including Flight Level (FL) 600, including the airspace overlying the waters within 12 NM of the coast of the 48 contiguous states and Alaska. Class B Airspace: Class B airspace is generally airspace from the surface to 10,000 feet MSL surrounding the nations' busiest airports in terms of airport operations or passenger capacity. Class C Airspace: Class C airspace is airspace from the surface to 4,000 feet above the airport elevations (charted in MSL) surrounding those airports that have an operational control tower, are serviced by a radar approach control, and have a certain number of IFR operations or passenger capacity. Class E Airspace: Class E airspace is the controlled airspace not classified as Class A, B, C, or D airspace. A large amount of the airspace over the United States is designated as Class E airspace. Typically, Class E airspace extends up to, but not including, 18,000 feet MSL (the lower limit of Class A airspace). All airspace above FL 600 is Class E airspace. Class G Airspace: Class G airspace is uncontrolled airspace and is the portion of the airspace that has not been designated as Class A, B, C, D, or E. This airspace extends from the surface to the base of the overlying Class E airspace. Although ATC has no authority or responsibility to control air traffic, you should remember there are VFR minimums that apply to Class G airspace.